Area Meetings are usually held in pubs...with free food. Area meetings are the base from which the BMC grows. It’s where local action starts and ideas get kicked about - in a friendly way, of course. One of their purposes is to inform local climbers and walkers about regional and national issues. They also act as a forum for local opinions on matters such as crag access, conservation issues, and national debates such as wind farms, land use and road building schemes. Increasingly, they are the focal point for getting local events such as crag clean-ups and climbing and walking festivals organised and funded. The BMC is divided into ten areas, eight in England and two in Wales. These are: Lake District; London & South East; Midlands; North East; North West; Peak District; South West; Yorkshire; Cymru North Wales; and Cymru South Wales; a Cymru Mid Wales outreach group also holds meetings. Each BMC Area usually meets four or five times a year. What happens at an area meeting? If anything needs to be taken to the BMC National Council that is done via the relevant area representatives, of which there are two for each BMC Area. Anything that needs local action and organisation is usually sorted out there and then. The food arrives and the entertainment begins. There are usually refreshments in the form of chips and butties. A guest speaker is often in attendance with slides of their latest derring-do adventure. Entertainment in the past has been provided by the likes of Nick Bullock, Gary Gibson, Alan Hinkes, Adam Long and Gordon Stainforth. Not currently a BMC member? 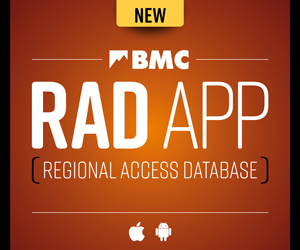 Support our work on behalf of climbers, hill walkers and mountaineers by joining the BMC.